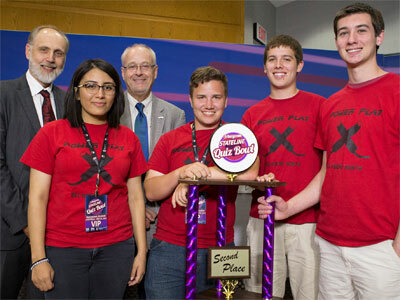 their Stateline Quiz Bowl championship Friday, May 29. Brilliance soared into the spotlight Friday night at NIU-Rockford along with an important plea to the teenage wunderkinds in competition there: Rockford needs them to come home after their college degrees are earned. 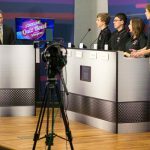 It was the finale of the first season of the Stateline Quiz Bowl by Bergstrom, a raucous evening of crazy-difficult questions and jaw-dropping correct answers from the previously undefeated teams of Rockford Auburn and Belvidere North high schools. When the final horn sounded, Auburn claimed victory with a score of 360-290, earning not only a tall trophy but a $40,000 scholarship fund from NIU to assist future Huskies. The university provided an $8,000 scholarship fund to Belvidere North, which also took home a trophy. 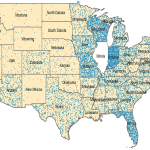 “This has created an energy around education and academic achievement and showcased what excellent schools we have in the northern Illinois area. We’re so proud of these students,” Baker said after shaking hands and posing for photographs with both squads. Baker’s words echoed the sentiments of Jack Shaffer, president and CEO of tournament sponsor Bergstrom. The Stateline Quiz Bowl blossomed in response to a Transform Rockford plank: to shine a spotlight on providing quality education, thereby improving workforce readiness and providing better opportunities to young people. For the young competitors, however, the order of the night was flexing the muscles in their minds. Host Nick Toma laughs with the Belvidere North team. The championship began with a correct answer – “taxes,” supplied by Auburn’s Cole Timmerwilke – and ended with another: “Bill Clinton,” courtesy of Belvidere North’s Matt Stites. In between came a dizzying assault of questions on architecture, computer code, France, geography, government, Greek letters, literature, math, medicine, Morse code, movies, music, poetry, politics, science, U.S. and world history and video games. Auburn, the reigning state champions in the IHSA Scholastic Bowl, never trailed. 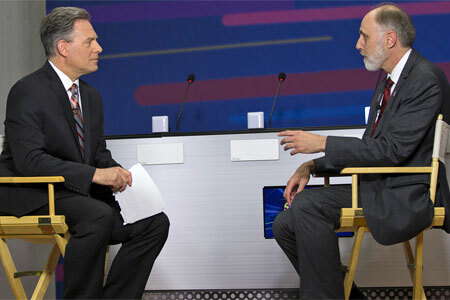 Usually, he said, “this is an activity that has not resulted in a lot of fanfare.” However, thanks to the weekly broadcasts, his fellow students were talking about the power of the mind. Meanwhile, the road to victory wasn’t a cakewalk. “There were some good teams that we had to beat to win,” Timmerwilke said. Her students gather to practice three times a week, and although the players change each fall as seniors leave and freshmen arrive, Greene is accustomed to watching her seasoned veterans mentor rookies and help build their confidence and motivation to learn. Belvidere North Coach Laura Stites, who teaches at Caledonia Elementary School, also appreciated the attention paid to education. Toma interviews NIU President Doug Baker during the live pre-game show. Watching the whole spectacle take place since the Jan. 17 debut was host Nick Toma. Toma, anchor and reporter at WTVO/WQRF, had never hosted a game show during his 26 years in broadcast news – and he wasn’t initially sure that Stateline Quiz Bowl offered the right way to change that. After months of moderating the “fun and friendly competition,” he’s amazed by how sharp the teens are. He’s impressed by how well-coached they are, how they’re trained to pick up on clues to the directions his questions are heading. He’s intrigued by their lives away from Quiz Bowl, how some are athletes and others are artists. 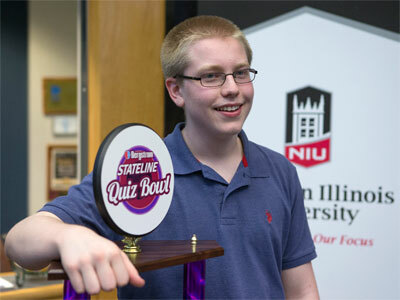 He loves to talk about the kid who plays theremin – “Who plays the theremin?” he joked with the NIU-Rockford live audience – and about tiny Paw Paw High School, which didn’t have a Quiz Bowl team but proudly assembled one after an invitation from the game’s organizers. join the Belvidere North team. Friday night also gave Toma a chance to make teens happy. Once Auburn correctly answered the weekly Giordano’s pizza party question – the answer, for those playing at home, was “The Heisenberg Uncertainty Principle” – Toma pretended to receive some “breaking news” in his earpiece. I would have liked to have read in this story the names of both Auburn High School students who were named to the World Quiz Bowl. The fact was mentioned but not the students names. Also, of interest would be reading what the next stage was, where and when. What is the final goal??? Keep the interest and momentum flowing!!! You had us at academic quiz bowl. Give us something to shout about; someone local to cheer onward. Pride in our community and hope for our young people. You want them back??? Support them now. Thank you, NIU, for the scholarships and for offering your facility for the Quiz Bowl competition. Thank you Bergstrom’s for your support and sponsorship. The summer internships are truly wonderful opportunities for college and life bound young people. I truly hope your investment pays off; and they return to Rockford to make it a better place for everyone. Hi Lynn, thank you for your encouraging words! 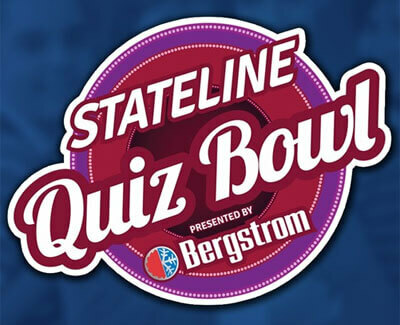 The Stateline Quiz Bowl has been so popular that 32 teams will be competing in season two, which will kick off this fall. There were 22 teams in the first season so this is quite a jump. NIU is proud to be an integral part of this celebration of academic excellence in northern Illinois. This was definitely an excellent competition to do and this undoubtly was a great experience for these students. I think an excellent next step from here would be to do something similar (although maybe not televised) with teams of NIU undergraduate students. Students can form teams to get asked questions covering simpler topics from all of the departments (questions that would get asked in 100-200 level courses from the various colleges and their respective departments). Winning teams would win scholarship money toward their continuing undergraduate studies OR, for seniors, toward graduate studies at NIU. Maybe have teams be about 7-8 people so that teams can cover as many colleges and departments as they see fit. This is just throwing out an idea.